I've been looking for a good speaker that will suffice that Oomph that I want to hear and feel. The problem with some speakers is that they tend to overblow some of the highs and just deliver the lows, or vice versa. Therefore, the effect is, you're not hearing some parts of it that you usually capture when you're using earphones/headphones. Our prayers were somewhat answered when we got our hands into this little monster, the JBL On Stage® IV speaker dock for iPod/iPhone. This cool UFO-looking speaker dock is…more than meets the eye. The design of JBL On Stage® IV speaker dock for iPod/iPhone strays away from the conventional style of tin can speakers. This is somewhat ET-inspired mid-portable speakers. I use the word "mid", to differentiate it from the ones that can easily fit your pocket. Since JBL never want to sacrifice the audio quality of the device, there are four 1-inch Transducers w/ inverted aluminium dome installed, which powers the speakers to make sure that you will get big sound from a small package. They are tri-dimensionally placed to give you that surround sound that you can place almost anywhere inside your home. You place it in a corner and your guest(s) won't be able to tell where the speaker dock is located. It feels like it comes from the four corners of your room. The Package contains the JBL On Stage®* IV Speaker Dock, power supply, remote control and iPod/iPhone adapter. With these gadgets, are loads of audio from different genres. This is for us to tell how good, nasty, this little monster is. Since this is made to work perfectly with an Apple product. The iPod iTouch 4G docks smoothly to the unit. 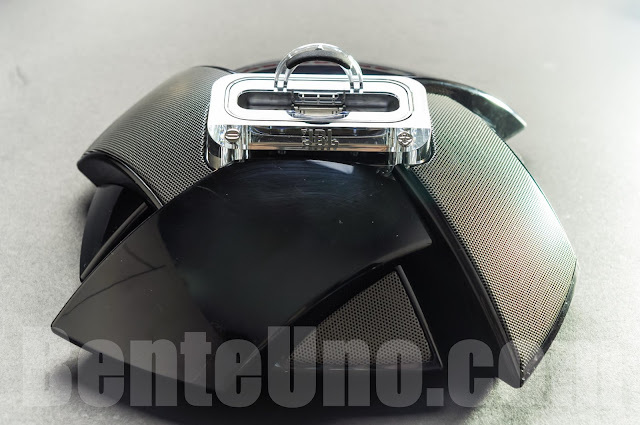 You don't have to be techy to be able to get this speaker dock running. I played some, Pop, Dance, and some classic love songs; it made me go Wow! 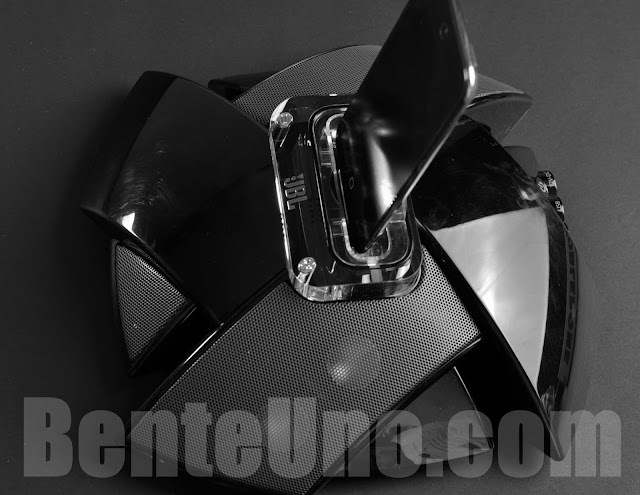 We've noticed that the audio is crisp, beautifully and equally delivered on each dome. JBL On Stage® IV speaker dock for iPod/iPhone, is an amazing piece that was manufactured to please an average audio-addict like me. With the help of the IR remote included in the package I can easily go loud or go discreet in seconds. You can easily pause, skip to the next track, or go previous, without the need of touching the speaker dock. At the speaker dock, there two buttons that looks like screws, at first glance. They are actually volume buttons to control the loudness. If pushed at the same time will pause the audio, then press them again, continues the music. 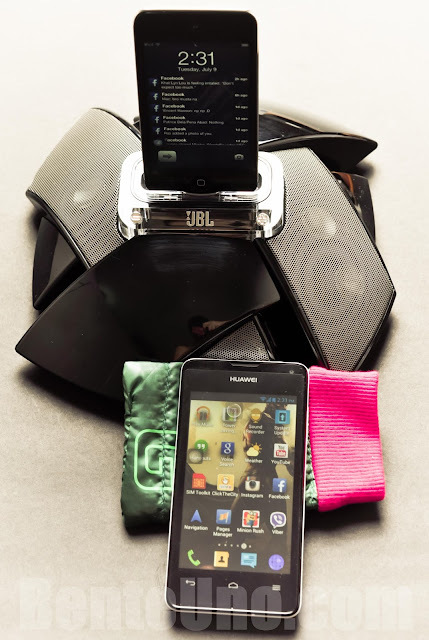 Moving forward with the non-Apple devices, the BB Curve 9320 and Huawei Y300, I easily connected the stereo cable and the audio goes out on the JBL On Stage® IV speaker dock. We've noticed that the sound relies on these phone aside from the speaker volume. So expect that if the external unit's sound is not in full volume, even if you turn the speaker dock's volume all the way up, you won't hear the monster. This should not be a disadvantage. Remember that this was developed to be iPod/iPhone compatible. Having the capability to use the non-Apple devices is truly a plus. USB port (USB Mini B) – which allows you to sync your Apple device to iTunes installed on your computer, cable sold separately. You see, even if this JBL On Stage® IV speaker dock for iPod/iPhone is clearly built with Apple products in mind, it didn't discriminate other devices. I tested this unit with an android phone and a Blackberry, no issues! I just connected a 3.5mm stereo cable and it plays without any special configuration. This is really a mid-portable a device, which can fit a messenger bag, or backpack. Just make sure that you have bubble wraps covering this so it won't scratch. We didn't notice any movable parts that can be damaged while mobile. So if you want a small gathering to be alive, you can bring this speaker dock with you and share that party tracks with your friends. They will be truly stunned with the aesthetics and sound quality, plus you'll be celebrated after, post party celebrity. No power outlet, no worries. You can still enjoy that clear and crisp sound of you JBL On Stage® IV speaker dock for iPod/iPhone using 6 AA batteries. No more excuse to not get that party started. JBL On Stage® IV's unique design and audio prowess are features that you can't really ignore, plus the fact that this is, JBL by Harman. This is a good companion for your compatible Apple devices, or even non-Apple. This should still work for iPod/iPhone that uses the lightning port, you just need to use the adapter. For a cheaper yet convenient way of using newer Apple Devices, simply use that 3.5mm stereo cable. JBL engineers must have already foreseen this that's why they included the 3.5mm port. Genius right? We enjoyed it more when we listen to MP3's with acoustic parts, since we can hear them all just like we are at the recording studio in front of the music artist. Remarkably, JBL-technology-inside and out. For audios with a lot of bass, this little monster can produce just the right amount of it, but expect it to be full and not scattered. We've been searching online on how much this currently costs. Good thing that I saw one online, selling this little monster for less than 4k (PH), brand new. Not bad for a high-end brand known for its quality and features that truly delivers. This may had been sold in the market for quite some time, but if you still have those older iPods and don't want to upgrade, this is what we recommend you to get. 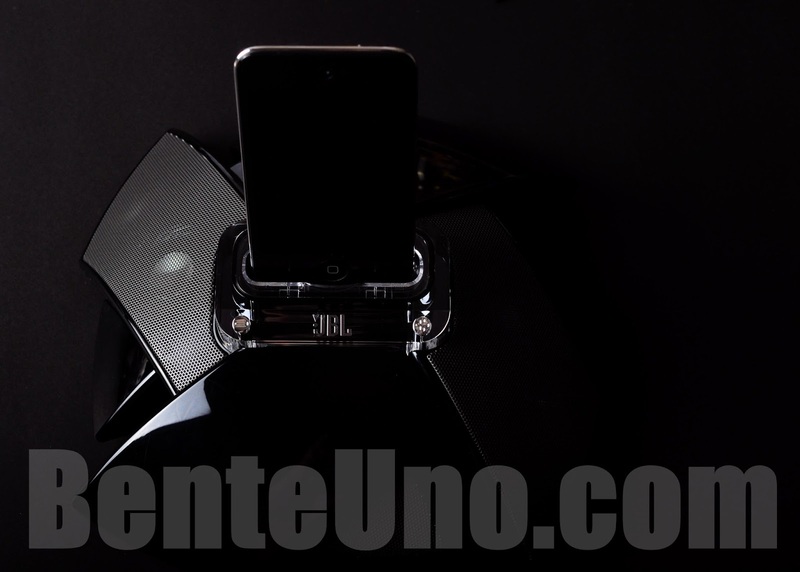 When are you planning to take this JBL On Stage® IV speaker dock for iPod/iPhone home, and make it your little monster too? We hope that this simple review will help you make that decision.